allround geek: Telltale website down, new Monkey Island almost here! 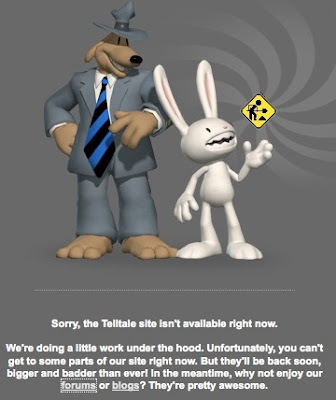 Telltale website down, new Monkey Island almost here! Ok, I just got back from going out for drinks and checked to see if the new Monkey Island is out in order to buy and download the first episode from the telltale website. The site appears to be down. This can mean one of two things. Their servers could not manage the traffic 'cause tens of thousands of people are trying to do the same thing as me, or they took the site down for maintenance to upload the new game. At either case I initally got a maintenance screen and after a few minutes I could not even connect which meant the their server was down. At any rate the new Monkey island is almost here. This with the Lucas making their old loved adventures, such as Indiana Jones and the Fate of Atlantis and Loom, available for purchase from Steam tommorow feels excellent. Adventures have just come back to mainstream and are making headlines again...Hoorey!!! The game is out and available for purchase from both telltale website and Steam. I 'll pee in me pants!